Last week we had a look at the European source cruise market by country as it reaches a figure of 5 million cruisers annually, while the US is just under 10 million. This week we look at the effect that Americans cruising in Europe are having and the development of the European Cruise Council. Last week we started what is the remarkable story of how cruising has taken off in Europe over the past few years. This week we continue that story by looking at the American view of European cruising and also the nascent European Cruise Council and its role. Apart from the European market and the American market of course nearly all cruise ships in recent decades have been built in Europe. While that's a different subject, orders have fallen recently and are not expected to go back to previous levels after the recent boom in deliveries. Not only are indigenous Europe-based cruise lines like P&O, Thomson, Costa, MSC, Aida, TUI, Louis, Pullmantur and Iberocruceros gaining from the boom in cruise trade in Europe, but so are the Americans. While some lines such as Royal Caribbean and NCL have been growing their own European-sourced business very quickly, others such as Carnival Cruise Lines usually just base ships in Europe for American travelers (who can then take advantage of the US on board currency to insulate themselves against foreign exchange risks). 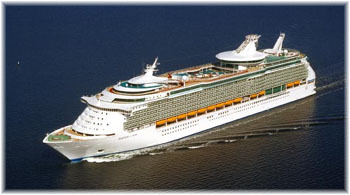 Royal Caribbean International will have eleven ships in Europein 2011, having even gone to the extent of abandoning their Los Angeles-based cruises to bring ships east (Carnival will meanwhile be taking over in California). The formerly Los Angeles-based Mariner of the Seas will be moving to Rome from March to November 2011, while the Liberty of the Seas will be based in Barcelona and the Independence of the Seas now will sail year-round from Southampton. Royal Caribbean will also base a ship in Palma, the traditional base for tour operator ships (such as TUI/Thomson, with whom they halve a half interest in TUI Cruises) and also to take on Aida Cruises. Sister line Celebrity Cruises will have six ships in Europe next year including all four 2,850-berth Solstices, as has already been outlined by the Cruise Examiner (April 26, 2010). Celebrity Eclipse will sail from Southampton, Silhouette from Hamburg and the Rome (Civitavecchia), Equinox from Rome as well and Solstice from Barcelona. 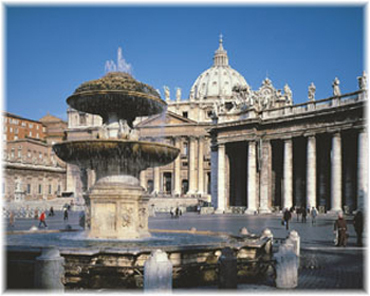 Princess Cruises will have seven ships in Europe in 2011. Three of the lines newest ships, the 2,600-berth Crown Princess and Emerald Princess of 2006 and Ruby Princess of 2008, all 113,561 tons, will be based there, as will their two boutique style ships the 700-berth Ocean Princess and Pacific Princess will sail the Mediterranean. 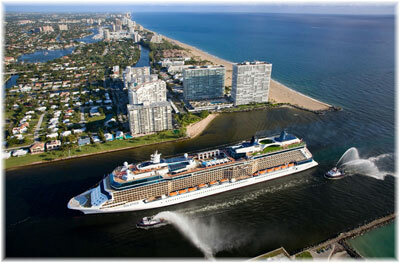 Ocean Princess will offer a number of 7-day cruises and will also cruise northern Europe and the Atlantic. Meanwhile the original 2,600-berth Grand Princess returns to Southampton while the Star Princess will also be based in the Med. NCLwill be returning the Norwegian Epic to Europe in 2011 and will have as trio of ships based there in 2011. The line has even opened a web site at www.ncl.eu, something of a first it seems. The 4,100-berth Norwegian Epic will thus become the largest European-based cruise ship and the Norwegian Jade will be based in Venice after her winter season from Barcelona while the Norwegian Sun will be based in Copenhagen. Although Dover and Southampton have both lost UK-based ships from NCL the line's big effort in 2011 will be put into booking Brits on 7-day fly/cruises on the Norwegian Epic as well as on the other ships at Venice and Copenhagen. With the Norwegian Epic to be based at Barcelona next summer, Carnival has also made a decision to base the 3,100-berth Carnival Magic there. The Magic, a sister of the recent Carnival Dream, will be delivered next year by Fincantieri. This will mean Barcelona will have all of the 155,873-ton Norwegian Epic, 121,878-ton Celebrity Solstice and 128,251-ton Carnival Magic based there, the biggest ship from each of the "big three," while the 154,407-ton Liberty of the Seas will represent Royal Caribbean. Some contest that well be, with the four ships totaling 560.409 tons and offering 13,620 lower berths among them. Barcelona is sometimes called the Miami of Europe when it comes to cruising, but its relative importance is actually more than that. Barcelona handled two million of Europe's five million passengers in 2008, or 40% of the market. While Miami also handled two million passengers, this was only 20% of the North American market. Even adding in Fort Lauderdale's 1.28 million gives only a 33.5% market share. It is only after adding in the three other Florida ports that the market share figure rises to half the North American market (see below). With such rapid growth in the European cruise market, it is not surprising that the industry got together in April 2004 to form the European Cruise Council. Formed by fifteen cruise operators in co-operation with the European Community Shipowners Association (ECSA) and based in Brussels, the ECC's role is not unlike that of the Cruise Lines International Association (CLIA) in North America. Now supported by twenty-four cruise line members, the ECC acts not only as a lobbying organisation within the European Union, particularly with regards to regulation, but also, through its association with the UK Passenger Shipping Association, as a marketing and promotional group. The ECC's first chairman, Per Luig Foschi, chairman and ceo of Costa Crociere SpA of Genoa, was followed in February 2007 by David Dingle, ceo of Carnival UK of Southampton. Effective this march, the chairmanship has been taken on by Manfredo Lefevre D'Ovidio, vice-chairman of Silversea Cruises of Monaco. Since the ECC was formed six years ago the number of European cruisers has risen by 74% and that the council is becoming more actively involved is shown by the fact that it will be holding its fourth annual industry conference in Brussels on September 14 to discuss future policy with representatives of the European Commission. The Norwegian Epic was officially named last Friday in New York by the sometimes-called "Queen of Country" (country music that is) Reba McEntire, Oklahama-born daughter of a steer roper and successful country singer and television actress. NCL ceo Kevin Sheehan first met Reba on another NCL ship and discovered that she was a regular customer before chosing her for Friday's ceremony in New York City (itself known as Nieuw Amsterdam between 1609 and 1674). Yesterday, Independence Day, the Epic also hosted Macy's 34th Fourth of July fireworks display. As an interesting aside, both the Norwegian Epic and the Nieuw Amsterdam, which was christened yesterday in Venice, come with a Manhattan dining room. Yesterday, the Nieuw Amsterdam, latest 2,106-berth addition to the Holland America fleet (and its 15th) was christened in Venice by Her Royal Highness Princess Maxima. As part of the ceremony, a captain from each of the line's fifteen ships arived by his own vaporetto in preparation for greeting the princess. This Nieuw Amsterdam, the fourth of the name, is the 11th Holland America ship to be christened by a member of the Dutch royal family. Her Majesty Queen Beatrix named sister ship Eurodam in 2008. Princess Maxima herself is married to Prince Willem Alexander, heir apparent to the Dutch throne, and could therefore one day be Queen of the Netherlands. The fact that both new ships have a Manhattan restaurant will ensure that at least one remains. The other is on the Celebrity Mercury, which is to become Mein Schiff 2 next year. North American ports have actually been seeing a diminution of their cruise business, albeit minscule, over the last three years, and the figure has now dropped back below 10 million according to figures released by the US Maritime Administration. Whereas 10.29 million sailed from US and Canadian ports in 2007, this figure dropped to 9.92 million in 2008 and 9.84 million in 2009. By cruise lines, Carnival and Princess together accounted for 48.8% of the market, but once Hollan America Line is added the figure reaches 55.4%, and 56.9& with Cunard and Costs, whose ships are usually based in Europe. By comparison, Royal Caribbean and Celebrity account for 26.7& and NCL only 11.1% of the North American sailing market. Of slightly fewer than 10 million cruise passengers in 2009, Florida's five ports (Miami, For Lauderdale, Port Canaveral, Tampa and Jacksonville) accounted for 5.1 million or 51.8% of the total. Jacksonville, the terminal port for ships from New York until the mid-1920s, has regained some stature with 188,000 passengers in 2009, well more than double the 87,000 cruise passengers who used the port in 2008. Further north, New York fell 15.5% from 477,000 to 403,000 cruise passengers. Pacific Ports suffered, with Honolulu down to only one third of its peak in 2007 (since the withdrawal of two of the three NCL America ships) and Alaska is about to take a beating because of its $50 head tax (which has now been dropped to �$23.50 on the 90% of sailings that call at both Juneau and Ketchikan). Of these amounts, $4 goes to the Ocean Rangers program. Los Angeles was down by 32.1%, from 607,000 to 412,000, while nearby Long Beach rose 13.7% from 365,000 to 415,000, exceeding Los Angeles in 2009. Seattle was down slightly, from 435,000 in 2008 to 430,000 while Vancouver recovered 4.4%, from 406,000 to 424,000 passengers.